Our guest blogger from Brady writes about using the LINK360™ software application to address confined space assessments and permitting related to lockout/tagout standards. create & track confined space permits. In many cases, mitigating lockout/tagout (LOTO) hazards involves preventing hazards introduced in confined spaces like atmospheric, engulfment or entrapment. Brady's LINK360 software (see box below for more information) helps customers further reduce the risk of injury or death by adding confined space to the LOTO and standard work instruction management already released. Assessing the hazards that are contained within a confined space, and outlining how to mitigate them, will help improve safe human entry and temporary occupancy to perform work. The granting of permits is another safety protocol to ensure the proper processes are being followed to lessen the risk of injury or death. Tracking changes and permitted work histories tied to confined spaces -- Assessment creation, printed permit scanning, or permit supervisor review can be handled online with LINK360 software, which is significantly quicker and easier to review and modify. A few of the reporting options include: Assessment due for audit, recently revised assessments, assessment history, assessment by location, permit forms due for audit, equipment reports, and permit history. Using, storing, and updating assessments -- Many are still using paper forms to perform assessments and storing them in drawers…where they are rarely used or updated. This is no longer an issue with LINK360 software because the entire process is created and stored online making it completely paperless and easy to update, store, or distribute. Paper documentation needs to include every option possible to be checked -- Errors when filling out a paper permit, like simply checking the wrong box, can create ambiguity and introduce safety hazards. The LINK360 Software confined space functionality helps forward the knowledge created from the assessment to inform the creation of the permit for entry. Permit options are then pre-filled or reduced based on the information designed by the assessment, reducing ambiguity. A photo at the top level of the assessment is also available to assist contractors and maintenance personnel to identify entry points and hazards. 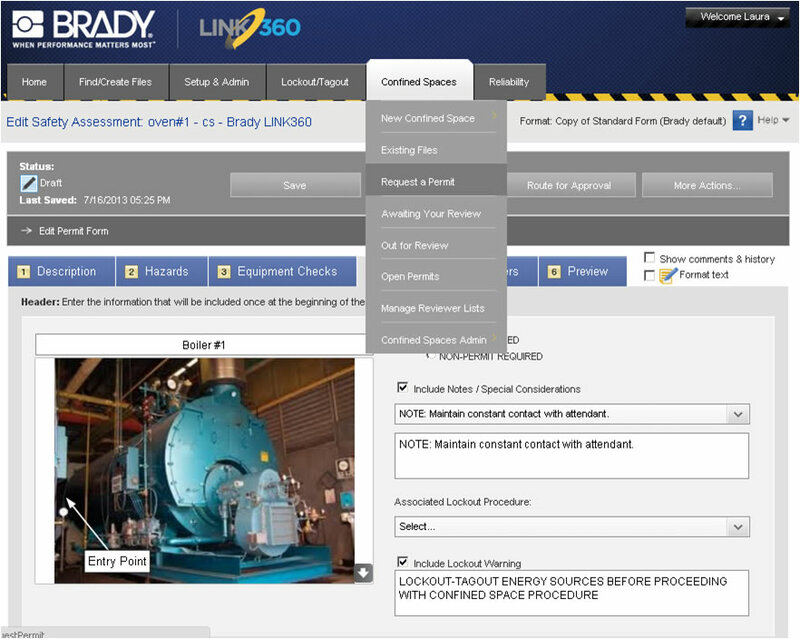 Brady launched its LINK360 software platform in August 2012. LINK360 gives managers a 360-degree view on all activities performed to create, use, and update equipment visuals at a single location or across many locations. Many of LINK360's EHS and Lean tools like reporting, auditing, document management, procedure standardization, and label and tag printing are means to an end. These tools help the user create a visual environment for operators, safety engineers, and maintenance personnel to link up procedural tasks with visuals that identify those points of interest with similar visual standards for easy shut downs, cleaning, inspections, maintenance, and many other tasks. In addition to the management of confined space assessments and permitting, it also offers lockout/tagout and operational reliability management. Brady also provides services to assist customers in the creation of their visual assessments through our global client services team. These services include: Visual lockout/tagout procedures, preventative maintenance procedures, and visual confined space procedures. Q Source would like to thank our guest blogger, Marlon Davis, from Brady Corporation. Thank you very much for your contribution to The Q Source Resource. For more information about, or to place an order for Brady's LINK360 product, please give us a call at 800-966-6020 or contact us via email. If there's a product or topic you'd like to see The Q Source Resource write about please let us know. We'd also appreciate if you share this blog post with your friends and colleagues via the social media links below. If you have questions or comments about the LINK360 software or other Brady products please leave us a message in the comments section.